I hadn’t fished the BA for years in this area. I had an itch that needed scratching so I wandered around for a while looking to see if I could spot a barbel. I went to one of my favourite spots and found about 8 chub and a lone barbel of about 8lbs feeding on the pellets that I threw in. The river had some colour so I couldn’t see into deep glides where there could have been many more barbel. I wandered and met Trevor whom I had not seen for ages. I stopped for a long catch up. Finally I moved up to another area where there was a willow in the water and some gravel just above. The swim was only about 18 inches deep. I threw in a few pellets trying to draw the fish out from beneath the branches. It worked a treat as you can see in the video. That’s great I thought. It got even better as 2 barbel came up onto the gravel to feed. It’s wasn’t for long but enough me to get excited. I looked at other swims but the clarity wasn’t that good. I found my banker swim and put in a few pellets and I wandered off to look at other places. On returning I found about 8 chub and another 2 barbel feeding away. Now this swim is a hook and hold swim. I could lower the bait into the swim without any disturbance. The chub came out and very quickly the rod hooped over and I was playing a lovely littl chub of a few pounds. Thinking that I wouldn’t get another chance. Not so they continue feeding and mopping up all the pellets. 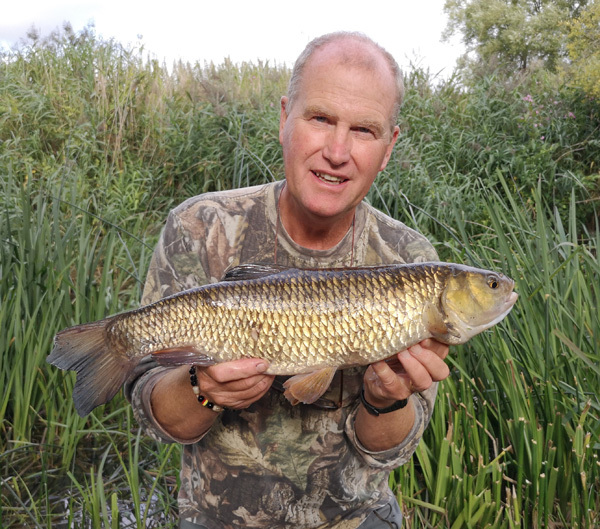 The barbel would whoosh into the swim tails thrashing away and pick a few pellets and then return to their safety hole. Well I had one more chance and this time I only just managed to keep this one out of the snag. It was a much better chub and not too bad for the BA. It went 4lbs so more than welcomed. It was a joy to be back on the water 3 casts and 2 chub. I was surprised to see 8 other anglers up there fishing. So it must be worth it. This entry was posted on Wednesday, August 22nd, 2018 at 8:52 pm	and is filed under Uncategorized. You can follow any responses to this entry through the RSS 2.0 feed. Both comments and pings are currently closed.